Good quality halter made from double layers of 16mm webbing. 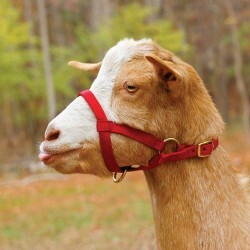 To measure a head to determine the correct halter size, measure in a figure 8 around the nose and over the head in the approximate position of the halter. Good quality halter made from double layers of 16mm webbing.Sizes: Small 68 - 86cm; large 88 - 1..
Good quality halter made from double layers of 16mm webbing.This size is Kid, up to 4 months ..
Good quality halter made from double layers of 16mm webbing.Sizes:This listing x-small / Cr..
An adjustable web halter with chrome plated fittings. Especially made for these breeds. Available in..
Good quality halter made from double layers of 16mm webbing.Sizes: Large 88 - 115cm; Small 68 - ..
Alpaca Webbing Halter - High Quality CriaGood quality halter made from double layers of 16mm web..
Alpaca Webbing Halter - High Quality Medium SizeGood quality halter made from double layers of 1..
Alpaca Webbing Halter - High Quality LargeGood quality halter made from double layers of 16mm we..
Good quality halter made from double layers of 16mm webbing. This size is large 96 - 120cmSizes..
Good quality halter made from double layers of 16mm webbing.This size is medium 84 - 108cm..
Pump Repair Kit for Udderly Ez Milker.Kit includes the Handle, Bottle clip, 2 Bottle O-Rings and a.. This harness is a simple and effective mothering-on aid, particulary useful for maiden ewes and does.. Offset Insulators 150mm Steel Post Poly Offsets Pack of 50..